This post originated from The North American Insulation Manufacturers Association. This post was the most active blog in the institutes history. The ante has been raised by states adopting the 2015 IECC energy code, and builders are scrambling to meet new requirements. A large part of the new requirements involve envelope air leakage standards. Simply put, the house (envelope) air leakage, when tested at 50 Pa pressure differential, ‘shall not exceed’ 5 air changes/hour (ACH) in U.S. climate zones 1 and 2 (warmer areas) and 3 ACH in the remaining cooler zones 3–8. New homes must be tested, and those meeting the requirements will receive a “Certificate of Occupancy,” which will be necessary for sale of the structure. Because the building must be largely completed before the testing can be performed, builders get one shot at achieving the air leakage standards, if the building doesn’t pass, costly rework and retesting must be done to ensure compliance with code. “If you drill it, you fill it” is the new mantra that sums up the importance of minimizing air leakage holes and gaps while construction is ongoing. Some builders are attempting to achieve the new standards using labor-intense methods such as caulking interior framing gaps, and/or taping and rolling exterior sheathing seams with specialty tapes. Taping of sheathing seams and water resistive barriers certainly helps to mitigate air intrusion, but it may also shift the air intrusion location to other unsealed areas. When buildings are not sealed completely, air flow within the wall will result from the stack effect. The stack effect occurs when there are differences in temperature and moisture content of the inside and outside air. Warm air is more buoyant than cold air and will rise above the cooler air. In a house wall, a column of air is present and air buoyancy will result in air flow if the wall cavity isn’t properly sealed. Consider the house as a ‘whole-system’ during a wind load event. Wind load against the foundation top (50 Pa = 20 MPH wind load) forces air currents upward and is caught where the siding overhang is lower than the sheathing, creating a small soffit-like trap, or worst, a U-channel (see figure) exactly where the lineal sheathing to frame gaps are located. To compound the problem further, planned superior air flow, above the wall leakage point at the top plate, drafts air upward from soffit to ridge vent. This air flow results in a “dynamic” flow of air up through the wall cavity that is driven from below by wind load. The physical alignment of air buoyancy being pushed in from the bottom gaps and lifted from the top exit point can play a role in ice-damning on the roof because it is directly below the loss of semi-conditioned air and vapor passing through the wall cavity. This heat loss can be a contributing factor to ice damning and can occur 24/7, not only during the freeze/thaw cycle that occurs during daylight hours. Keep in mind that the framing gaps can run nearly the entire length and width of a house, at both top and bottom plates, regardless of the nail pattern. The linked video (air flow video) demonstrates how virtually every wall built in America today functions at a 50 Pa pressure differential. Undeniably, unsealed sheathing to frame gaps (which, as mentioned above, can account for 50% of air leakage), when taken together, greatly contribute to the stack effect and energy loss in all climate conditions and offer a likely target for mitigation of the problem. In the U.S. our climate zones vary greatly, and separate building zones have different approaches to preventing thermal loss from leakage. 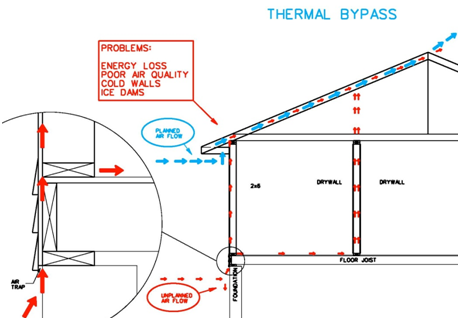 The most important factor in every building zone throughout the U.S. is that proper envelope sealing is necessary to increase energy performance and builders are requiring framers to play a larger role to ensure proper air sealing. Best practices reveal that sealing leaks during the framing stage is cost effective when labor is effectively utilized. In this era of skilled labor shortages, preventive methods must not only be effective and inexpensive but must also be easy to install. Builders need to consider all these aspects when selecting the best sealing system to implement. In a previous post, we explored a new approach to continuous air sealing that has demonstrated great promise under ASTM E283 protocol1 testing by top laboratories and state agencies. This novel approach eliminates air leakage by more than 80% at 50 Pa in traditional frame building methods, mitigating air intrusion so optimum performance levels can be obtained.